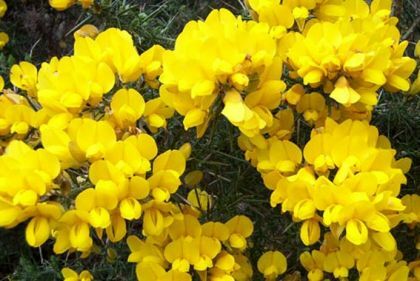 Whether you know it as Gorse, Furze or Whin, this must be our most remarkable native shrub. Throughout the year, the rich yellow peaflowers seem to light up the Irish landscape. The 15-20mm long flowers, with their wonderful aroma of coconut, are borne on stems of spiny bluish-green spikes. The leaves have been modified over centuries into rigid and furrowed thorns which withstand the harsh conditions of winters at higher altitudes, making the entire bush one mass of prickles and spines. These shrubs form very many hedgerows around our fields, they line our country roads and particularly from February to May, when their flowers are in abundance, they are a sight to behold. This plant belongs to the family Fabaceae. I probably first came across Gorse on one of many regular family visits to Glendalough, Co Wicklow as a child. I photographed it in Glenmalure, Co Wicklow in 1992 and 2000. 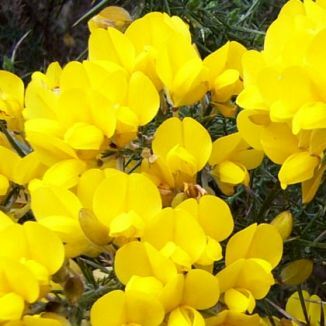 From our folklore: 'Get a few handfuls of the yellow blossoms of the furze and boil them in water. Give the water as a dose to the horse and this will cure worms'. From the National Folklore Collection, University College Dublin. NFC 782:356 From Co Kerry.